There are several requirements for the parents who wish to baptize at the Cathedral Basilica of St. Francis of Assisi:At least one of the parents should be a Catholic in good standing and practicing the Catholic faith on a regular basis. To be a practicing Catholic means to attend Sunday Mass on a regular basis; to make every effort to live the Gospel values as guided by the Commandments of God and of our Church. Both parents must attend the two Pre-Baptism Classes. In the case of a single/divorced parent, the one who has custody of the child must be the one that presents the child for baptism. If the parents have joint custody of the child, both must agree to the baptism. You must bring the child's birth certificate to the office to begin the process of the paperwork needed for baptism. If class has been attended elsewhere, a copy of the certificate must be provided. At least one Godparent is required. If more than one, only two. If two, one must be a male and the other a female. Must be Catholic and in good standing, and practicing the Catholic faith on a regular basis. If married, must be married in the Catholic Church. Cannot be married civilly or outside the Catholic Church, or living together with someone as in marriage. If not a registered member of the Cathedral Basilica, must have the document: "Affidavit of Eligibility for the Ministry of Baptism or Confirmation Sponsor." Must attend the two Pre-Baptism Classes. 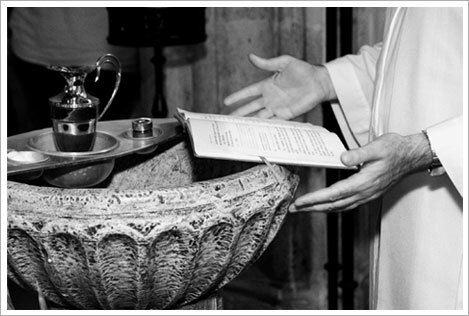 If completed the Catechumenate within the last two years Baptism Classes are waived. If not registered at a parish, must register and wait three months. Baptism is celebrated during the Mass. You must be at the Cathedral Basilica half an hour before Mass begins. Two classes of instruction are required for the parents and Godparents. Instructions are held at the Cathedral Parish Hall at 7:00 p.m.
Children preparing for first Holy Communion in May must first receive the sacrament of Reconciliation. Parents are required to attend Sunday morning classes at the Cathedral Basilica to help prepare their children for reception of the sacrament. Please see Elementary Religous Education link on the home page of this website. Third graders are eligible to receive the sacrament if they will have completed two full years of religious education in the parish or at Santo Nino Regional Catholic School, if they have accumulated no more than four absences as third graders (if they are registered in the Cathedral’s Religious Education program), and if they have received the sacrament of Reconciliation. See above for First Reconciliation information. In addition, parents are required to submit copies of the child’s baptismal certificate and proof of attendance in religious education classes at another parish if applicable. Parents must also attend three sessions of instruction offered by the Cathedral Basilica. Most of all, children must evidence a desire to receive the sacrament and an age appropriate understanding of the meaning of the Eucharistic sacrifice. Our Parish offers a comprehensive Catholic model of preparation for the Sacrament of Confirmation that helps teens grow closer to Christ and His Church. The program, called the Oneight, draws young people into a deeper faith that transforms their hearts and changes their lives. This program is based on creative and experiential catechetical methods and follows the flow of Liturgy: Gather, Proclaim, Break and Send. Adults and children seven years of age and older who have not been baptized in a Christian church and who wish to receive the Sacraments of Initiation in the Roman Catholic Church participate in the Catechumenate process. Call 982-3625 for more information and an appointment for an interview. Adults and children seven years of age and older who have been baptized in a Christian church and who wish to make a profession of faith within the Roman Catholic Church may call 955.8874 for information. Baptized, catechized adults who have made their first Holy Communion but who have not been confirmed are invited to join the Cathedral Basilica's Adult Confirmation sessions. Prepatory sessions are held in the late summer and again in the winter/spring. Call 955.8874 for session dates and an interview appointment. Confirmandi must have a sponsor, a practicing Catholic, who has already received the Sacraments of Initiation. If not a registered member of the Cathedral Basilica parish, the sponsor must submit an “Affidavit of Eligibility for the Ministry of Baptism or Confirmation Sponsor” from his or her own parish. Matrimony:contact the church at least 5 months prior to the date of marriage. Marriage Preparation: Sponsor Couple Program. All Cathedral Basilica of St. Francis of Assisi parish couples contemplating marriage must enroll in the program. If you are interested in seeking more information regarding Vocations to the Priesthood, please contact Rev. Michael De Palma, Vocations Director, Archdiocese of Santa Fe.